Dr. Kuzmiak was appointed Chief of the Breast Imaging Division and Director of the Breast Imaging Fellowship program in 2005 and has been on staff since 1999. 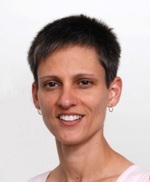 The recipient of numerous honors, her research interests include the interpretation and diagnostic analysis of digital mammograms, digital breast tomosynthesis, magnetic resonance imaging of the breast, automated whole breast ultrasound, dedicated 3D-breast computed tomography, dedicated 3D-photoacoustic mammography, intraoperative radiation therapy of the breast, and breast cancer genomics. Dr. Kuzmiak co-authored the book Digital Mammography with Drs. Etta Pisano and Martin Yaffe, and has published numerous articles in peer-reviewed journals. She is a member of the American College of Radiology, the America Roentgen Ray Society, the Association for Women Radiologists, the American Medical Women’s Association, the American Medical Association, and the Society of Breast Imaging, among others. In addition, she is a fellow of the American College of Radiology and Society of Breast Imaging. Dr. Kuzmiak is the current Chairman of the Breast Imaging Refresher Course Track for the Radiological Society of North America, a Medical Advisor of the Breast and Cervical Center Control Program of the North Carolina Division of Public Health and Human Services, a member of the Society of Breast Imaging Fellowship Match Committee, a member of the Tomosynthesis Mammography Imaging Screening Trial (TMIST) Steering Committee of the American College of Radiology Imaging Network, and a senior image reviewer for the Mammography Accreditation (MQSA) Image Quality Program, in both mammography and magnetic resonance imaging.